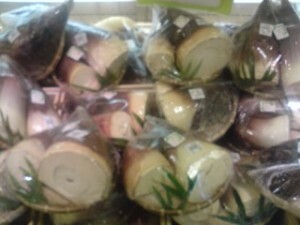 In April, bamboo shoots ( Take No Ko) hit the market across Japan, and become readilly available even to those living in big cities, far from any actual bamboo groves. As these beloved symbols of the season are at their best in late April and May, the Japanese everywhere, look forward to enjoying them prepared in a variety of ways. I have been told by Japanese friends who have lived abroad in places with no bamboo, that they would daydream about eating Take No Ko when spring arrived. That is how much this food is connected with the season. My friend Sato-San, who every year presents me with the most savory boiled bamboo shoots I have ever tasted( country style, with big chunks of bamboo), told me of how when she was a girl growing up in Mase, Tsukuba, her father would dig up the fresh shoots while she and her brother would gather wood for a fire, which they got going just outside the bamboo grove. 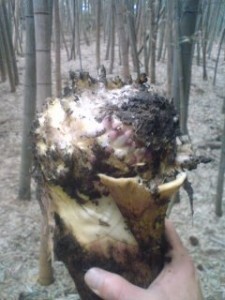 There , after peeling the bamboo, they would boil them for a couple of hours in a large pot with rice bran and chili peppers. The results of this process were most delicious indeed, a fact to which I can attest to ! Using all my might, and even all my weight ( which is not insubstantial) by jumping up and down on top of the shovel`s blade while it was stuck in the ground, I just couldnt make much progress. I must have made for quite a ridicuous sight as well, a Woody Allen or Charlie Chaplin attenpting to be a woodsman! Bamboo in its numerous varieties as found in Japan has always been an important material for making things ranging from the most common everyday household implements to the most sublime crafts ( whisks for the tea ceremony, for example or bamboo flutes). 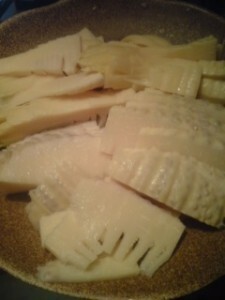 And though we know, because of the existance of certain poems and other references in classical Japanese literature, that the custom of eating bamboo shoots dates back many centuries, the variety that is most commonly eaten today- MO-SO-CHIKU, did not exist in Japan until about 250 year ago, when it was brought over from China, via the Ryukyu Islands ( Okinawa) first to Kagoshima. the most southern part of Kyushu Island. It reached the capital at Edo in the late 18th century ( 1774), when planted at the official residence of the Satsuma clan ( now Kagoshima) who had brought some up from their native province. After that this variety gradually spread northward, eventually reaching what is now Ibaraki. The Ishioka area now produces the most take no ko ( from mo-so-chiku) in the prefecture. The Ami area was also once very famous for bambooIn fact, in 1916, Ibaraki Prefecture established a Model Bamboo Grove in what is now Ami Town, in order to promote its cultivation. 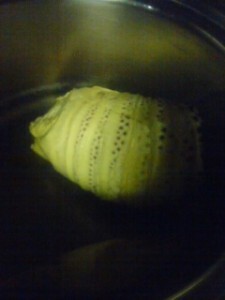 And... ready to eat- sliced, with soy sauce and wasabi- SUBLIME! 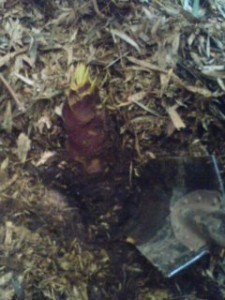 Your bamboo shoot digging story is very funny. I laughed. I think you made a mistake about digging tecnique. 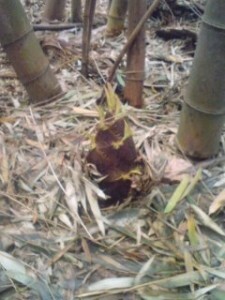 You said that the bamboo shoot is facing away from you. I think you had better dig with the bamboo leaning to you. Please try again. You can do it! You are right! The correct way to dig for bamboo shoots is to slip the blade under the shoot with the tip of the shoot facing towards you! Since the farmer was watching me and giving me instructions I surely DID try it from that angle- and from everywhichway – but no matter where I attacked from, it was hopeless. Maybe Ive just got to start working out at the gym again! Is there any other trick of the trade?